CCYP is excited to announce a NEW Connect Event for 2019, Friends + Family Connect! 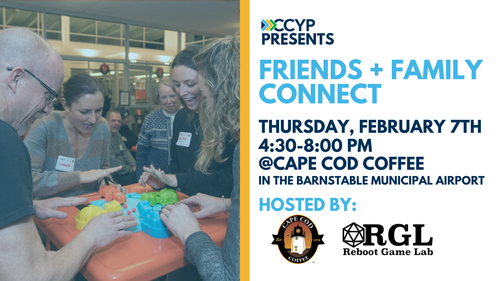 Designed to be both family and networking-friendly, CCYP's Friends + Family Connect allows young professionals to rub elbows with fellow Cape Codders without leaving their families at home. All are welcome - including children of all ages! Appetizers and a cash bar will be provided. This month, we're excited to team up with Reboot Game Lab and Cape Cod Coffee for a fun-filled night of games! Games catering to all ages - from young to the young at heart - will be available. Enjoy a screen-free game experience while meeting friends you didn't know you had!